Once again, Screwfix donated the services of its large Contact Centre in Yeovil, Somerset to support the much-loved BBC Children in Need appeal on 16th November 2018. 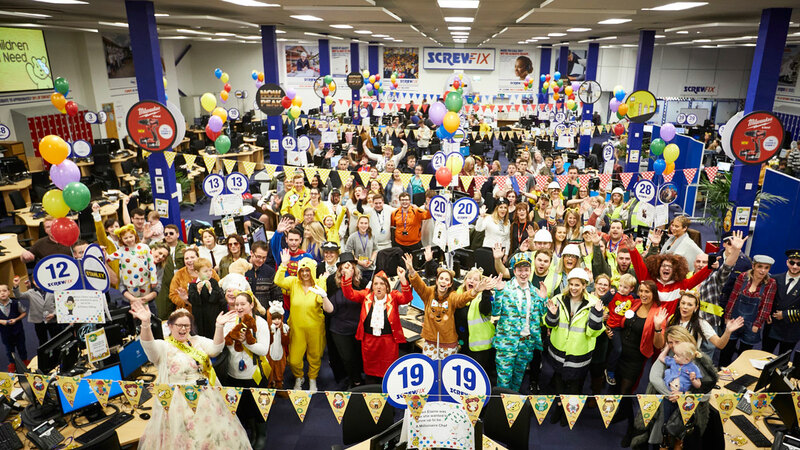 Hundreds of employees from across Screwfix volunteered their own time, to help take calls from people across the UK, during what was a busy, fun filled night. Volunteers and staff manned the phone lines from 7.00pm until 11.00pm, in the company’s award-winning Contact Centre in Yeovil. 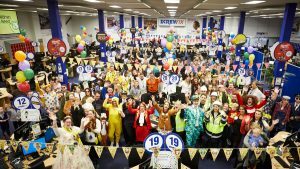 Earlier in the week, Pudsey visited the Yeovil Head Office, to encourage staff to dig deep and get into the spirit of things- by dressing up and joining in the fun and games on the night. There were also generous donations of food, refreshments and prizes kindly provided by local businesses, to keep the volunteers going throughout the evening. “Now in our thirteenth year of taking calls for Children in Need, we were delighted to be supporting such a worthy cause again this year.Last Friday, we took thousands of calls from across the UK, showing just how generous the public really are when it comes to supporting Children in Need. We’re confident that we can help exceed last year’s total during this year’s fundraising drive, and I’d like to thank all Screwfix staff for donating their Friday night to help,” commented Screwfix CEO, John Mewett.